Skywatch Friday – Looking through the windshield… | Highway - the only way ! 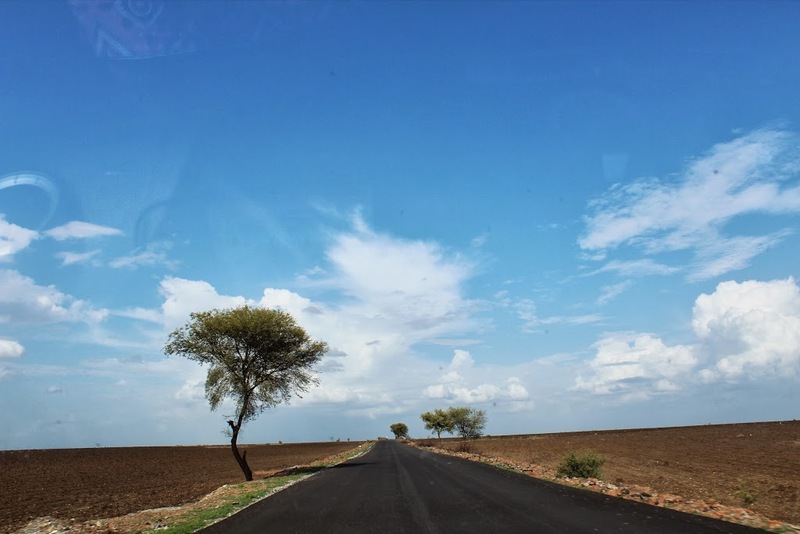 …along the highway near Kurnool, India, we spotted this pretty picture – freshly ploughed black soil cotton fields in anticipation of the monsoons, blue sky and white spongy clouds promising some rain, a lone tree gazing at passers by and the smooth road ahead ! Who wouldn’t want to drive here? It would be great fun, just like posting on Skywatch Friday every week ! PS: Oops, the car accessories got captured too ! Wonderful shot. Taking it through the windscreen adds to the composition, I think. Love it even though its through the windshield. I did not notice the reflections until you pointed them out. It did not strike us that these would get reflected 😉 Thank you for stopping by and Happy Sky Watching to you too ! Great shot! It is similar to the Mississippi delta area of Arkansas and Louisiana here in the USA with miles and miles of flat land with cotton and soybeans. Thank you. It is always interesting to know about places from around the world ! I love everything about this. Great composition. Thank you and that is such a wonderful quote !